The traction of the Adidas D Rose 4.5 amazes a lot of shoe owners. The thickness of the rubber outsole can withstand both indoor and outdoor pressures. Several buyers appreciate the leather material on the upper because it breaks in nicely. The Geofit technology used on the inner part of the shoe provides great fit and comfort to the ankle and heel, according to many. The superb responsiveness in the midsole supports quick direction changes, say multiple users. A lot of testers commend the heel-to-toe transition of this because of the comfort provided by the Adiprene+ technology in the heel and the EVA foam in the midsole. A good number of purchasers comment that the containment is good with this Three Stripes basketball shoe model; this might be due to the SprintFrame technology in the heel counter. Plenty of buyers praise the uniqueness and attractiveness of the zebra design of the Adidas D Rose 4.5. The same praises were received by the continuously retroed first Air Jordan high-top sneaker. Some shoe owners complain that the shoelaces are too short, making it difficult for them to tie. A handful of users do not recommend the shoe for athletes who wear ankle braces during gameplay; the ankle area will only become too tight. In its place, they recommend the 6th Stephen Curry shoe with Under Armour. A few mention that the material in the forefoot area lacks breathability. The basketball shoe model is not true to size, a number of users say. It is recommended to try the shoe first before purchasing. Overall, most reviewers cannot help but mention that the Adidas D Rose 4 and 4.5 are almost the same. The differences are minimal. The most notable would be the perforations in the ankle area and the breathable mesh, which in the midfoot area for the 4.5 and in the forefoot area of the 4. 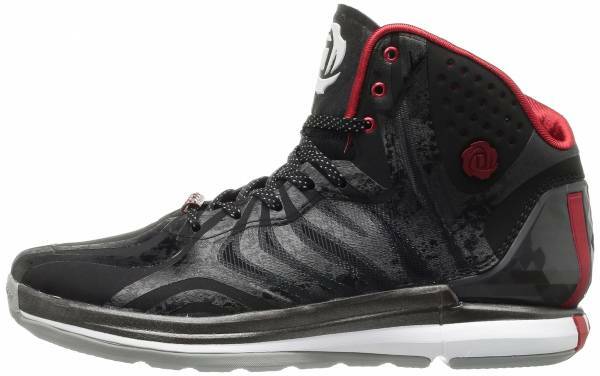 At $140, the Adidas D Rose 4.5 does not disappoint. It provides excellent responsiveness, stability, and impact protection. This shoe model is a favorite of many athletes and regular basketball sneaker buyers. Make it yours too. While I do like to see more change and innovation involved, I do love playing in these and I think they just might be my favorite adidas hoop shoe of all time. I would definitely recommend it for super quick guards who are on the move, people who do a lot of cutting be it on the offense or defensive end. You are really gonna like this shoe. The Rose 4.5 is one of my favorite shoes I’ve tested so far and one that I anticipate hooping in for a long time. The Adidas D Rose 4.5 could have easily been the last signature shoe for Derrick Rose. His absence on the court because of his injuries almost affected his shoe line. The shoe model is packed with technologies from top to bottom. The heel counter has the SprintFrame technology for lockdown. The midsole has the famous Adiprene+ technology for impact protection. The Geofit technology provides comfort. Cushion. No doubt, the responsiveness of the shoe is from the Adiprene+ technology in the midsole. It is the circular crash pad glued to the heel area. It absorbs impact, making the feet ready for its next killer move. The majority of the midsole is made of EVA. The comfort provided by the foam greatly affects the heel-to-toe transition. It also adds flexibility to the shoe. Traction. The traction of the Adidas D Rose 4.5 is reported to be excellent. The multidirectional herringbone pattern has thick rubber grooves that allow the outsole to hold its own even when used on outdoor courts. The type of rubber compound used also benefits indoor gyms because it does not leave marks on floors. Another contribution of the traction pattern is it prevents dust from sticking to the shoe. It helps avoid slippage and injuries to the player. Length and Width. The Adidas D Rose 4.5 is designed to fit like a glove. According to a good number of users, the shoe benefits the narrow footed because of the SprintFrame technology installed in the heel counter. For wide-footers, it is either to go a half size up or skip the shoe model. Lockdown. The lacing system of the shoe is the common lace up style. By tying the shoelaces property, a good lockdown is obtained. With the help of the Geofit technology in the collar and the tongue, the athlete achieves a better lockdown and support as a bonus. As most buyers say, containment is the biggest attribute of the Adidas D Rose 4.5. The materials in the upper of the Adidas D Rose 4.5 is composed of synthetic leather with overlays on the forefoot. The midfoot has a mesh material that provides ventilation to the feet. The removable insole of the shoe is made of polyurethane. It is a lightweight and highly abrasion-resistant rubber that is commonly found in sports shoes. Aside from the midsole rubber, there are PU insoles that provide more cushion to the feet. The Adidas D Rose 4.5 has numerous soft stripes on the upper. The DERRICK ROSE callout is on the toe cap. On the lateral side is the prestigious D Rose logo. The shoelace ornament has the D Rose logo and ROSE callout. The same logo is also on top of the tongue. To make the technologies used on the shoe known, an ADIPRENE callout is printed on the lateral side of midsole. On the lateral side of the heel counter, a SPRINTFRAME callout is printed diagonally. The famous Three Stripes of Adidas are located on the heel counter extending down to the outsole. The company callout and logo are located on the medial side of the shoe.